Funan to be redeveloped as lifestyle destination with retail, leisure and office use. The redevelopment of the 31-year-old complex follows owner CapitaLand’s decision to reposition the site as a lifestyle destination. Covering 887,000 sq ft, the mixed-use building will offer a six-storey retail mall, two six-storey Grade A office buildings and one nine-storey block of residential apartments. Key to the identity of the new venture is a focus on the experiential, including the creation of a series of gardens. Grant Associates has created a landscape design concept that centres on the theme of ‘Nature: City’. The scheme incorporates a water garden with views of Fort Canning, an ‘urban farm’ and edible garden, elevated walkways and a roof-top communal garden with views to the Marina and Central Business District. By creating a range of special gardens and green spaces, the landscape strategy aims to consolidate CapitaLand’s vision of relaunching Funan as a destination, in addition to offering enhanced shopping facilities. A series of plaza spaces within the public realm announce the entrances into Funan at ground level, while the Water Garden on level 4 centres on a pool that stretches out from the planting, reaching towards views of Fort Canning. Access to the pool is via two themed approaches, the Forest Steps surrounded by lush planting and the Water Steps, which are surrounded by living water features. The Garden Stair links levels 4 to 7, taking visitors along raised walkways that are enveloped by planting and nature. In places, the walkways appear to extend beyond the confines of the building to create look-out points that project the viewer over the lower levels and street below. The Funan Urban Farm aims to showcase sustainable food production with a range of technologies. 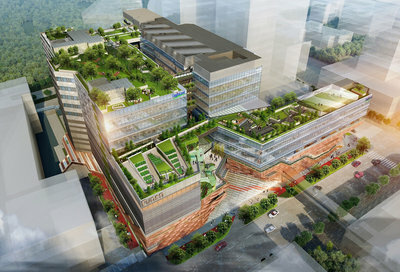 It will be unique to Funan, adding to its status as a special destination. The intention is to demonstrate the diversity and cyclical relationships of crop production rather than produce food on a commercial scale. The Edible Garden on level 7 looks across to the Urban Farm and overlooks the Garden Stair. Featuring a range of edible plants, the space will offer sweeping views of the surrounding city from the comfort of giant swings and hammocks floating above planting. The Community Garden on the roof combines a variety of recreational components including; a chill-out valley of giant sun loungers and mounds covered in storm lilies; an alfresco kitchen with edible table and tilted shade lawns that look out towards Fort Canning. Funan is scheduled to re-open in 2019. Tamasine Scott, Senior Associate at Grant Associates, comments: “Our intention for Funan is to excite and entice. We want to create surprising experiences within a rich and diverse multi-dimensional public realm. A landscape that invites further exploration, helping to draw people through the multi-layered building and entwined landscape features.